Padlocks are a portable lock that may secure valuables that cannot be traditionally locked. A padlock consists of the actual padlock body, and the shackle. The shackle is usually a U shaped loop of metal and is locked onto the body of the padlock, in some cases a hasp is used to lock a building. The shackle is the most vulnerable part of the padlock. Many different types of padlocks are available from brass padlocks, to weather resistant padlocks. Some padlocks use their own special hasp to lock, and do not even have a shackle, these are called shackless padlocks. Padlocks There are 6 products. 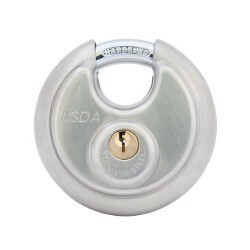 LSDA Pin Tumbler Laminated Steel Padlocks have a case-hardened steel shackle for tough protection against cutting and sawing, laminated steel construction for additional security and durability, plastic bumper to prevent scratching and marring items underneath the lock, available in many sizes, keyed alike, or keyed different. 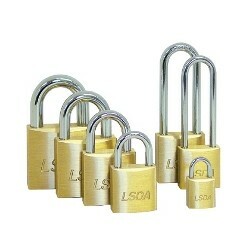 LSDA Pin Tumbler Solid Brass Padlocks have a solid brass body that is highly corrosion resistant, with a chrome plated hardened steel shackle, available in many sizes and keyed alike or keyed different. 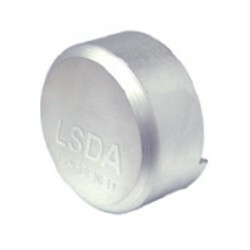 LSDA Shielded Disc Padlocks are ideal for use on vending machines, lockers, bicycles, and more. They have a shielded shackle which practically eliminates shackle exposure to attack, corrosion resistant stainless steel case, hardened steel deadbolt, double locking shackle, available keyed alike or keyed different. 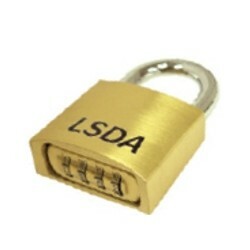 LSDA Resettable Combination Padlocks have an easy to use resettable combination, and a hardened steel shackle built to withstand attacks from cutting and sawing. 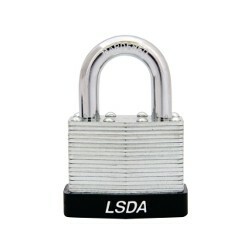 LSDA Shackless Padlock have a concealed rear locking bolt that eliminates exposure to attacks from cutting, pry bars and saws. 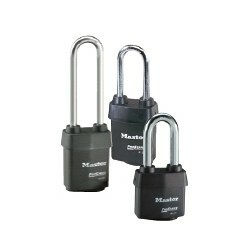 These shackless padlocks require the use of the shackless padlock hasp, and are built for maximum security, available keyed alike or keyed different.